A delivery of homemade mince pies for one of our lovely neighbors. 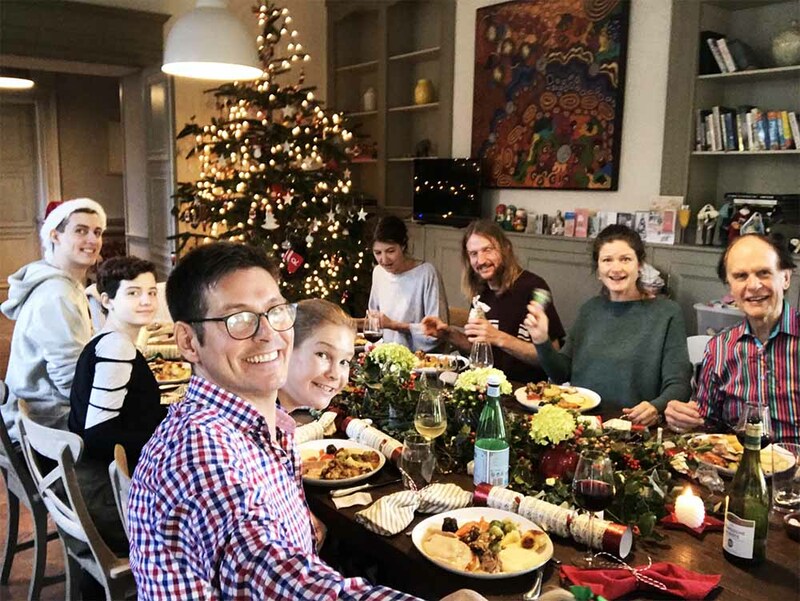 Each year we celebrate Christmas with a different mix of family and friends, depending on where we are in the world. 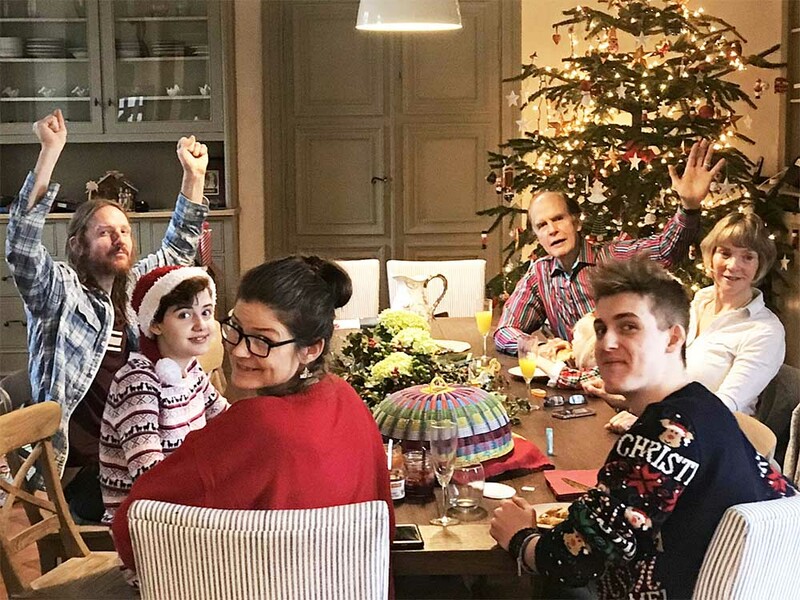 This year we spent our first Christmas in France, and Justin’s side of the family came to stay. But we had a slight problem… no beds! Back in February we made the decision to custom design our furniture in Bali and have it sent to France on a shipping container. Well, as is often the case with ambitious plans, it took me a little longer than I anticipated to get my head around the designs, leaving little time for the furniture to be built. Oops. Luckily for us, we have been working with an amazing team of designers and artisans in Bali who, despite time not being on their side, managed to get every last piece of furniture made, and the shipping container delivered to our front door 2 days before our first house guests arrived. A big thank you to everyone at YMB Furniture for making it happen! The shipping container arrived at our gates on a huge lorry and started up the drive to our front door. Just when we thought all our Christmases had come at once, the lorry driver misjudged a turn and got completely bogged. There was no way he could move. The lorry driver called for back up, and a tractor arrived to tow him. No luck. The tractor wasn’t strong enough. The whole thing was starting to become a little funny, it was so crazy. Then our village mayor came to the rescue with a beast of a tractor. He managed to haul the lorry with our container of furniture to the front door, ready to be unloaded. What a legend. It’s times like this when you really realize how special it is to be part of such a tight community. Inside our shipping container! How relieved does the lorry driver look? It was a real team effort to get everything off that truck, but with about 9 pairs of hands we managed to get it done. We spent the next two days in a haze of furniture building. It was mayhem; but by some miracle we managed to get everything essential finished in time for our family’s arrival. The bedrooms are still very much a work in progress, but we now have beds! This mahogany four poster bed with dark green velvet headboard and baseboard was one of the pieces made for us in Bali. In between all the chaos, we tired to keep the spirit of Christmas alive. Rosie didn’t care that her gingerbread house had collapsed. We balanced the roof on a tissue box and she bedazzled it just the same. Santa also left a daily clue for Rosie in her advent calendar. The clue led to a little treat, hidden somewhere in the house. We bought this calendar at the Berlin Christmas Markets last year, and each time you open one of the doors, music starts and the little people at the top start dancing. It’s so cute. First to arrive were Blake and Nancy, all the way from Vancouver, Canada. As soon as they showed up, we felt like a massive weight had been lifted off our shoulders. Any more boxes that needed to be unpacked, or furniture that needed to assembled, was going to wait until the new year. Justin and I could finally relax and enjoy the lead up to Christmas. Hallelujah. We kicked off their visit with a very long lunch at our favorite restaurant, Nazere. The very long lunch is an art that the French have perfected (to our utter delight) and a tradition that I really hope is here to stay. Lunch at our favorite restaurant, Nazere - which also happens to be a lovely place to stay, if you’re ever in Gascony. One of the most anticipated pieces of furniture to arrive from Bali was Rosie’s first ‘big girl’ bed. Until now Rosie has been sleeping in a crib, so it was pretty special for her to be able to move into her new bed before Christmas. I was slightly worried that she might escape in the middle of the night, or roll out, but her first night was disaster-free. Rosie’s first night in her new bed. The craftsmanship of all the furniture from Bali was exceptional. With just a few hours left of school for the whole year, Rosie tripped over a ball in the playground and bumped her head, hard. There was blood, tears, and an almighty black eye - but luckily no stitches were needed, and she wasn’t concussed. That kid is made of tough stuff. On with Christmas we go! We thought it would be fun to make some mince pies for our new friends and neighbors in France. Eating mince pies in December is a tradition that Justin and I have both grown up with, but it’s not something you come across in France. 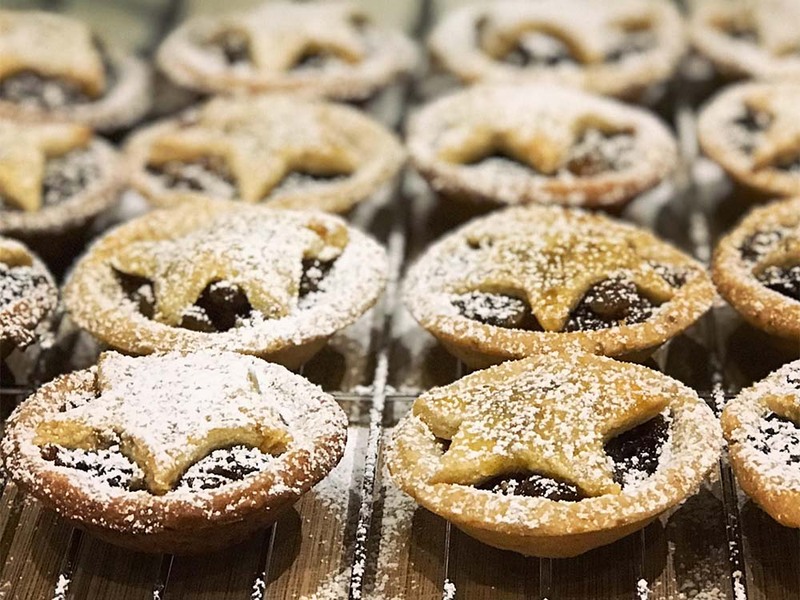 Homemade mince pies; we added almond meal and orange blossom to the pastry, and lots of Cognac to the fruit mince. Lots of baking ensued… And then it was time to make our deliveries! Visiting a neighbor to deliver our mince pies. Over the coming days, more and more family arrived. 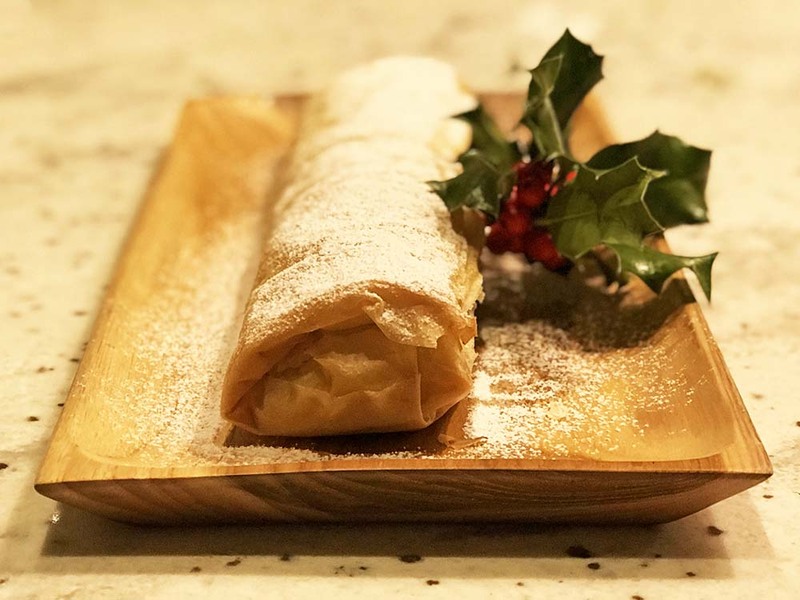 Our nephew, Thomas, came up with the superb idea of using the left over boozy-mince-pie-fruit to make this delicious Christmas strudel. Genius. And then came Rosie’s letter from Santa (in the postbox no less). 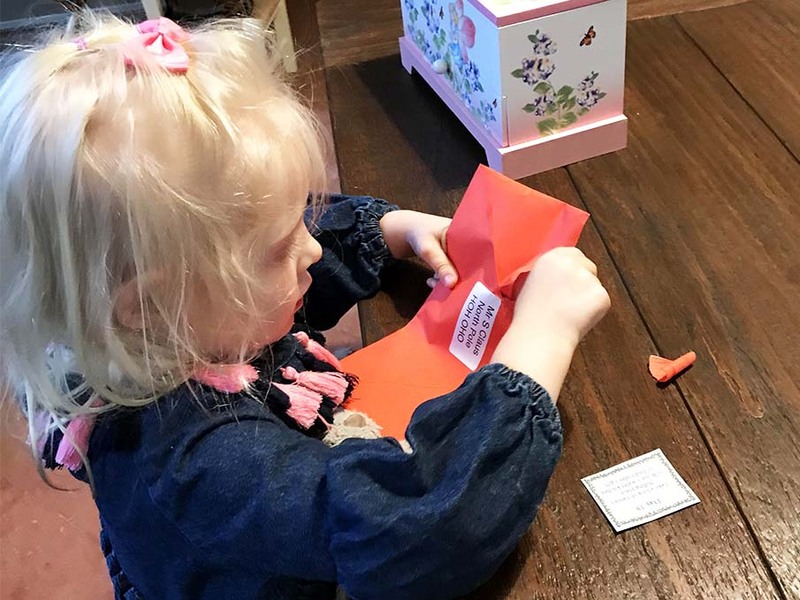 This was the first year Rosie really understood what it meant to receive a letter from Santa, and it was pure magic for all of us. Justin reading Santa’s letter to Rosie. Look at her face! Among all our holiday shenanigans, we completely forgot to order our Christmas turkey. By the time we realized this catastrophic festive faux pas, there were no longer any large turkeys left to buy in France’s South West. But just as soon as we had reluctantly settled on buying two small turkeys, Justin happened across a magnificent looking goose for sale at our local farmer’s market. After a small bit of Googling to establish how to cook a goose (!) our menu of two birds for Christmas Day was set. Rosie and I buying the last of our Christmas groceries at our local farmer’s market on the Saturday before Christmas. We decorated the dining table a couple of days ahead of Christmas. It was a little messy, but it set the tone for the fun to come. Rosie enjoying the festive vibes, eye patch and all. Rosie wore that red and green bow in her hair almost every day in December! 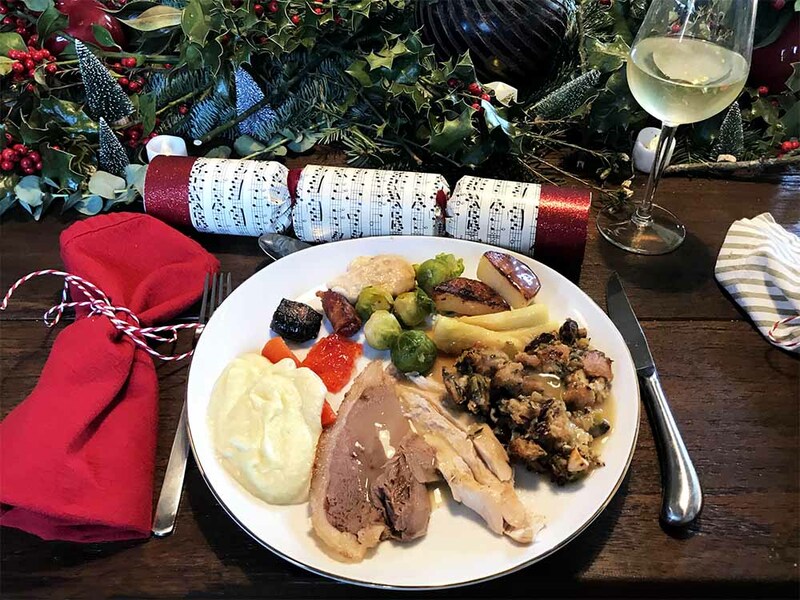 Our tablescape; lots of holly and red berries, pine branches and mini Christmas trees. 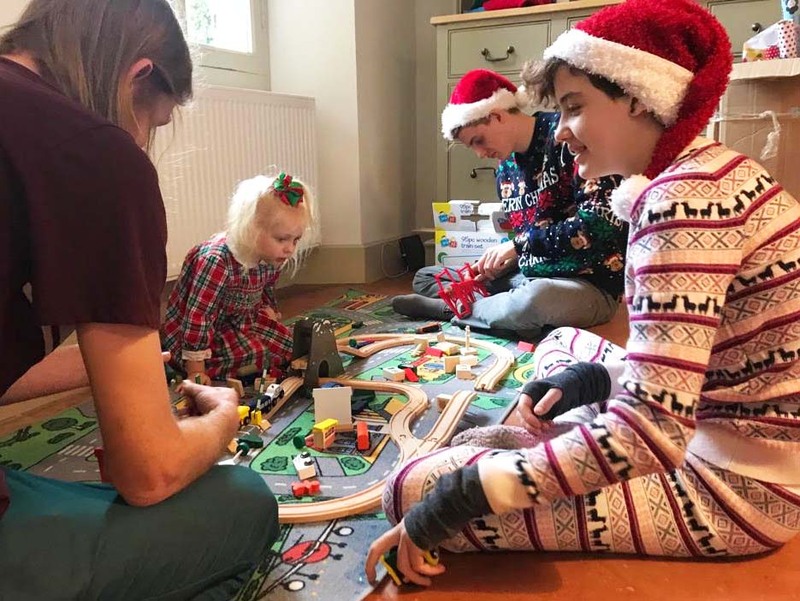 In the days leading up to December 25, we drank lots of champagne, played many games of scrabble, and lounged in our best Christmas pajamas and sweaters. 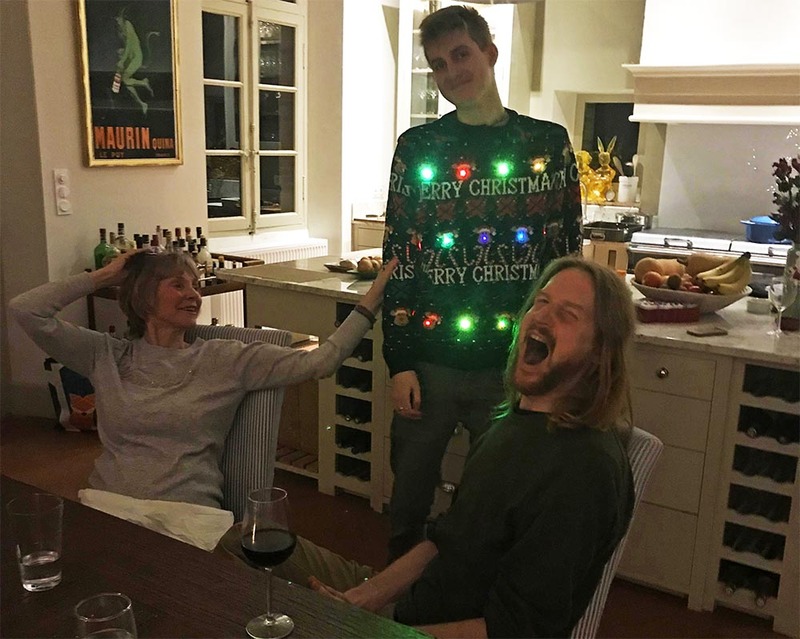 Thomas wearing the best EVER Christmas sweater. On Christmas Eve, Rosie and Justin set about writing a reply letter to Santa. Rosie adding a few finishing touches to the letter. Rosie set out her letter for Santa, along with a mince pie and a glass of sherry, by the chimney. And of course a carrot for the reindeer. Christmas morning was very exciting - although I’m not sure if it was more exciting for us or for Rosie! Rosie’s Santa sack full to the brim. Loving her new balance bike. Christmas breakfast with Buck’s Fizz. Playing with her new train set with Uncle B. And then it was time for lunch. We stuffed the turkey with oranges, and the goose with pears. Woohoo, the goose was a success! Justin was in charge of carving the goose. The creation of lunch was also a real team effort - which made it so much more fun. Clockwise from the top; we feasted on Brussels sprouts, goose fat roast potatoes, parsnips, bread stuffing made with prunes and our own foraged hazelnuts, turkey, goose, celeriac puree, roasted carrots, red pepper jelly, pigs in blankets (bacon wrapped sausage), devils on horseback (bacon wrapped prunes), and bread sauce. After an afternoon relax, it was time for Christmas pudding. This year I made it with lots of prunes, figs, Cognac, and Disaronno. Yum! The Christmas pudding, set alight. To end a wonderful Christmas, Blake read his annual story. Look at Rosie and Lucy’s faces - they’re absolutely enthralled! The perfect end to a very special day. P.S. 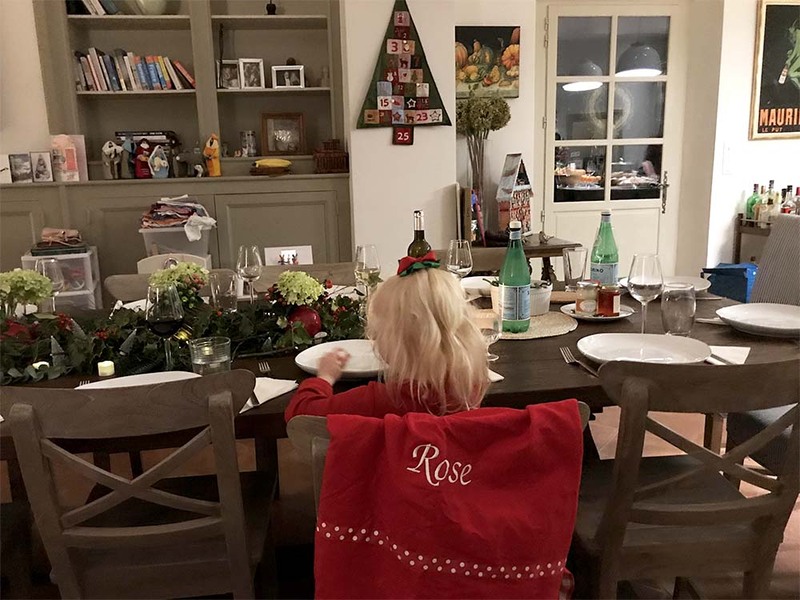 Raising Rosie, and Christmas photos from 2016.